NephMadness is living up to its name with major changes in the regional championship round. Rsantamariao, who had been in first place through the first two rounds tumbles to the eigth spot. PAVA_neph, who showed up on the leaderboard in second place after the second round results nailed the the Sweet 16 in calling 6 of the 8 winners, to take over first place. Previous winner, Carlos A. Machado, was also hot and picked 5 of the 8 winners and continued to rocket up the chart to fourth place. The following category leaders are from the registration question “Which best describes you?” If you should be on this list but are not, or if you are on one of these lists by mistake go to the bottom of this link for instructions on changing the answer to that registration question. 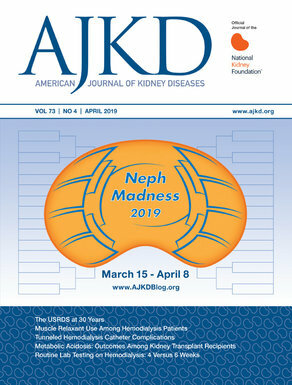 The above categories are eligible to win NephMadness prizes. Visit the rules for more information on eligibility.